People who’ve trained for years may not gain much from this section, but people who are new to gyms and training may find that they’re not exactly sure what some of the commonly used lingo means. Sometimes personal trainers throw terms at their clients that mean nothing to them, and if they’re too embarrassed to ask it can leave valuable information misunderstood. I’ve included pictures where appropriate and easier. I’ll be adding new terms regularly – please let me know if I’ve missed anything important out or if you’re not sure what something means. Literally meaning ‘with oxygen’, aerobic exercise is low-intensity high-duration exercise that needs oxygen and primarily uses the aerobic energy system, as opposed to short high-intensity activities that use anaerobic energy systems. Examples of aerobic exercise are jogging and walking. A type of stretching that used to be used a lot in 80s aerobics videos. It involves ‘bouncing’, often using your body weight, to increase the range of motion and flexibility. It is occasionally used by athletes but isn’t recommended for the general population. Abbreviation for biceps, the muscles located at the front of the upper arm. Stands for Basal Metabolic Rate. This is the amount of calories that would be burnt in one day if you were to lie down all day. The average is about 2000 for men and 2500 for women. Relating to the heart (cardio) and vein, arteries, blood vessels (vascular). CV is it’s often used abbreviation. A form of training that involves a sequence of different exercises that are performed in a row, often with a short break but can be done continually. Once each exercise has been done once then one ‘circuit’ has been completed, and you can begin the first exercise again to repeat the circuit. An exercise that uses two or more muscle groups and two or more joints. For example, the squat works the glutes, quads, hams, back and core and a whole host of other stabilizing muscles. Other examples: pull-up, shoulder press, press-up. The ‘lifting phase’ of a dynamic movement, when the muscle is contracting and shortening. For example, during the upward phase of a tricep extension, the tricep is contracting and shortening – it is working concentrically. Anatomically and generally refers to the body minus the arms and legs, and in fitness generally refers to the abdominal muscles (front torso, ‘six-pack’), the obilques (side torso) and lower back muscles (back torso). A naturally occurring substance that provides energy to muscle cells, and is used in high energy activity. Creatine can be consumed naturally but can be taken in higher doses as a supplement. Abbreviation for the deltoids – the shoulder muscles. Stands for Delayed Onset Muscle Soreness and it’s the aching you feel in your muscles 24-48 hours after a workout. It’s not a sign of injury, but shows that the muscles have been worked and will rebuild stronger! The ‘lowering’ phase of a dynamic movement, when the muscle is lengthening. For example, in a bicep curl when the weight is moving slowly back towards the ground the muscle is acting as a ‘brake’, controlling the load and stopping the weight from just falling down – it is working eccentrically. Minerals that keep your muscles moving and your nerves active, especially during exercise. They are lost through sweat and can be replaced by sports drinks or electrolyte powders. Examples are sodium, potassium, calcium and magnesium. Muscle failure or fatigue, is the point at which the muscle cannot possibly execute another repetition. You may hear a trainer say “5 reps to failure”, which you will not be able to physically perform a 6th rep.
A form of training that doesn’t follow a set structure but in which intensity levels are increased and decreased in intervals, almost at random, to work both the aerobic and anaerobic energy systems, test the body and to mimic sporting activity patterns. Means ‘speed play’ in Swedish. 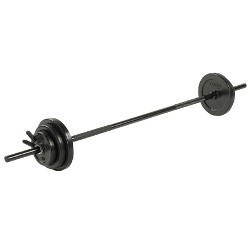 Weights that are not attached to a machine in any way, such as barbells or dumbells. The ability to perform everyday activities and real-life situations effectively and comfortably, such as walking up stairs, lifting things etc. Abbreviation for gluteus maximus, medius and minimus – the backside muscles. Abbreviation for the hamstring group of muscles located at the back of the thigh. A term for the growth and increase of the size of muscle. 8-12 reps to failure is considered the rep range for muscular hypertrophy. An exercise that works just one muscle and one joint. 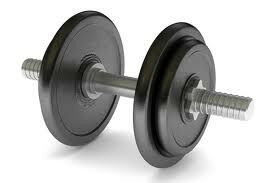 For example, the biceps curl just works the biceps – it ‘isolates’ that muscle. Another example is the lateral shoulder raise. Iso = the same; metric = length. The muscle is contracting, but not changing length. For example, if you hold a box in front of you, your biceps are not shortening or lengthening but are contracting and holding in the same position to keep the box in the air. Another example would be ‘the plank’ exercise which works the core muscles isometrically. A form of training that involves high-intensity ‘work’ periods followed by low-intensity ‘recovery’ periods. For example, 20 seconds of sprinting followed by a minute of jogging, alternatively for 10 minutes. Differs to Fartlek in that it is structured. The by-product of high-intensity activity that uses the anaerobic energy system and contributes the ‘burn’ you feel in muscles during such types of intense exercise. Abbreviation for the latissimus dorsi muscle located in the back. Tissue that connects bone to bone at joints. Can be torn or damaged if put under strain. Abbreviation for pectorals, the chest muscles used in the pec dec (fly) or bench press. Someone who helps you meet your fitness goals by monitoring your fitness and needs, designing you a program and ensuring you implement that program. Western-style personal training is fairly new to Bangkok. Abbreviation for repetition. One rep is one complete single movement. For example, lifting the weight down in a bench press and then pushing up to the starting position would be one rep.
1RM stands for ‘one rep max’ and it is the amount of weight in which only one repetition can be performed. 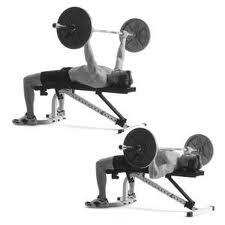 For example, if someone’s bench press 1RM is 100kg then they cannot bench press 101kg. 8RM means the maximum 8 reps can be performed at, etc. A unscientific way of gauging and feeling your own level of intensity or exertion of a scale of 1-10, 1 being the lightest possible exercise, 10 being as hard as possible. Trainers may ask you what level you think you’re at on the scale when you’re exercising. A set is a number of repetitions that are completed before the exercise stops. For example, someone training for strength may complete 6 reps before stopping. A form of stationary exercise bike that is mechanical and requires resistance to be applied manually to make it harder or easier. Most gyms have spinning classes that involve an instructor guiding a number of people to increase and decrease the intensity. Tissue that connects muscle to bone. Abbreviation for Trapezius, the large kite-shaped muscle in the upper back. Abbreviation for triceps muscles, located at the back of the arm. Abbreviation for the quadriceps group of muscles located at the front of the thigh. The amount of oxygen that can be taken in, transported around and used by the body. The VO2 max of an athlete would be very high.